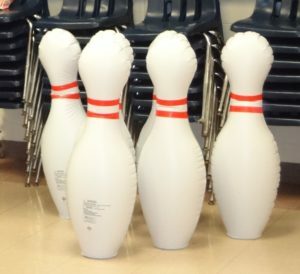 Winter Carnival is an annual event held at the December pack meeting. Scouts and their entire family are invited to participate. There are games, crafts, and cookie decorating. The Bears’ den is responsible for planning this event. For an elective, they created new games. Parents from the pack, the Bears & scouts from troop 1344 help run the stations. 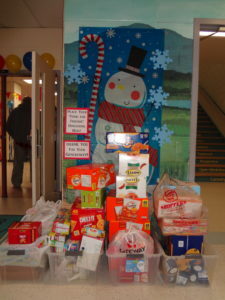 We ask scouts to also remember people in the community during the holiday season and we have a collection for a local charity to help give back to the community. Bean bag toss game made by the Bears as part of their elective. 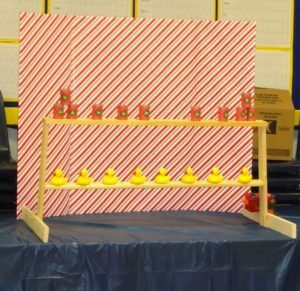 One of the Winter Carnival favorites of the night…catch a duck that has a star on the bottom and win a prize! 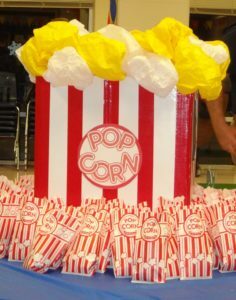 This was another favorite of the night. 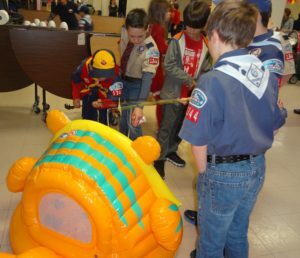 Nerf Target game – Scouts tried their best to knock the cans and ducks off the stand. 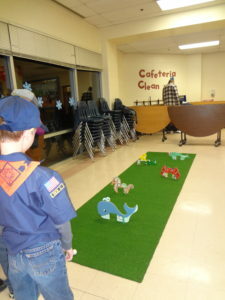 Scouts played this mini golf game by hitting golf balls with giant candy canes!